Tiger Enterprises manufacturers KENMAR dispensing guns for accurate application of caulk, sealants, adhesive and almost any other highly-viscous materials. KENMAR's Professional Line dispensing guns develop high pressure, to 100 psi, with minimal trigger movement. The full body design accepts disposable cartridges, sausage packs or economical bulk loads. Pneumatic Line caulking guns from KENMAR use air pressure to create a uniform bead of caulk, even with the heaviest of compounds, including adhesives, asphalt, cement and mortar. Prime Line caulking guns from KENMAR feature easy-to-use frame and half body guns that improve job speed and accuracy. Both models hold a standard cartridge and are made of heavy-duty steel for durability. 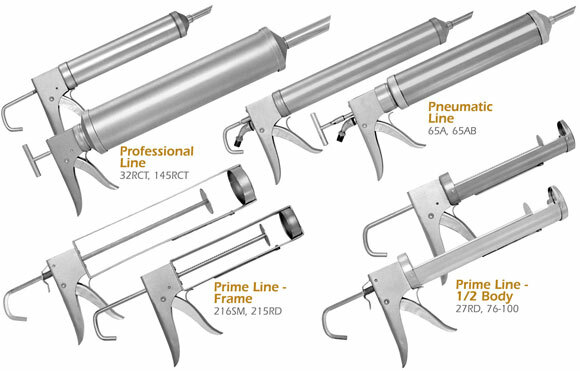 Prime Line caulking guns are available in both smooth and ratchet rod models and are guaranteed for life. KENMAR's Productivity Line includes a series of high-volume money saving bulk loaders that are easy to use and virtually mess-free.